【Multifunctional Bike Pannier Bag】Upgraded newly design bicycle bag for better goods sorting, not only can be used as bike rack bag with velcro straps and buckles, but as stylish commuter bag with a shoulder strap,or a handbag as well. 【Reflective Strips & Waterproof Design】Made of 600D Polyester for rainproof, durable and easy to clean, reflective strips on top makes it visible at night, safe is priority. 【Easily Mount Onto Bike Rear Seat】 There are 4 buckles on both sides and 2 long velcro straps in the front to fix it onto the bike seating rod. Top quality buckles and straps can hold a long time to use frequently, also the buckles can tighten up the bag easily without moving. 【Perfect Bags for Bike】Simple to mount on all kinds of bike rack seat or hanging on shoulder. wonderful for outdoors, cycling, camping, hiking and so on. 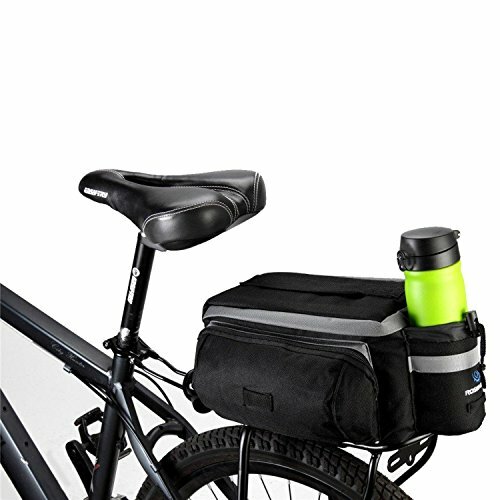 【Ergonomic Design Bicycle Storage Bag】6L large capacity cycle rear bag is made in such a way so as to be extremely ergonomic and comfortable to use. It is equipped with 2 zippered pockets to keep your most valuable stuff inside like iPhones, cameras or cash and credit cards. The strong velcro will keep the bag where it belongs and the spacious interior compartment will hold anything that comes in mind. The side water bottle case has an elastic drawstring that will secure your bottles in place.